I love sushi. What I don't love is ordering it at a restaurant, not only because it's expensive, but also because service at sushi places can be slow. At times I have waited 45 minutes. One time, people who came in after I had already ordered got their food before I did. 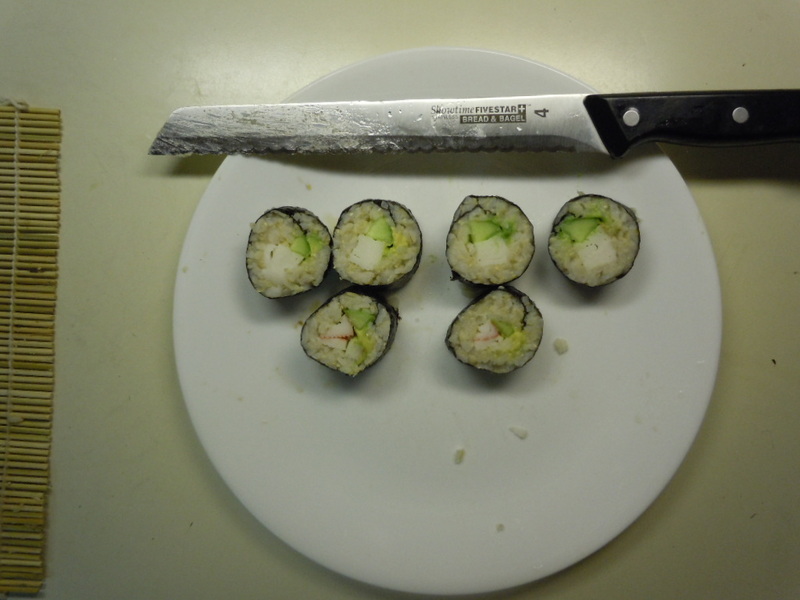 Making sushi is relatively easy and inexpensive. There are only two specialty items you will need, and neither is difficult to find. 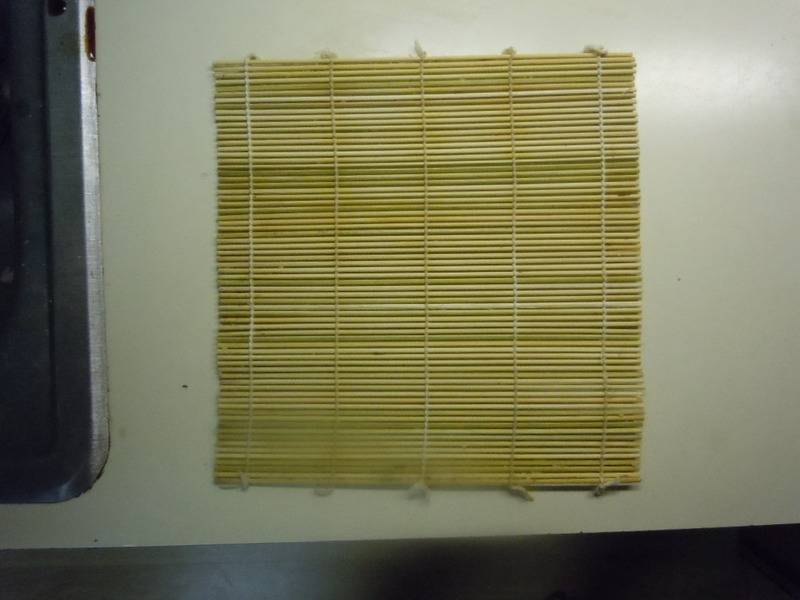 The first is a bamboo rolling mat. It can be found at Walmart, Crate & Barrel, Asian grocery stores, and online at Amazon or eBay. 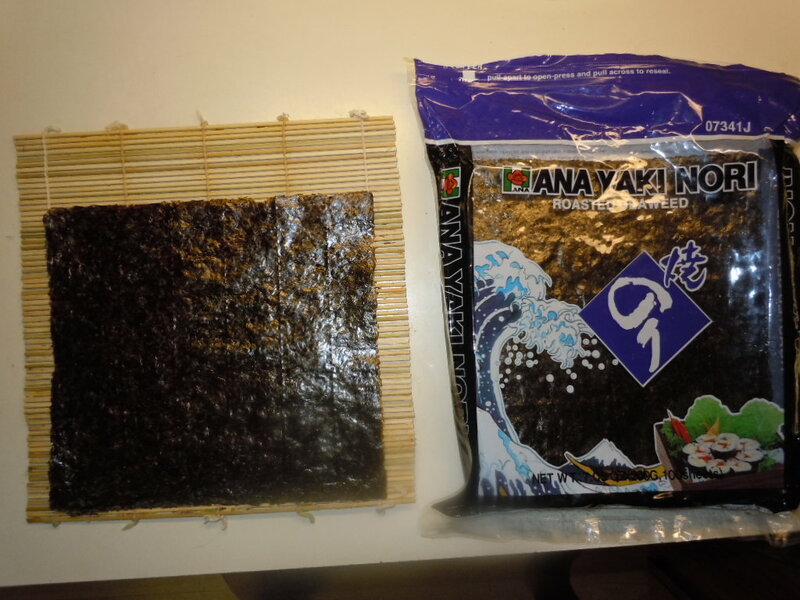 The other is a pack of seaweed sheets (called nori), easily obtainable at most Asian grocery stores and several online places including Amazon. 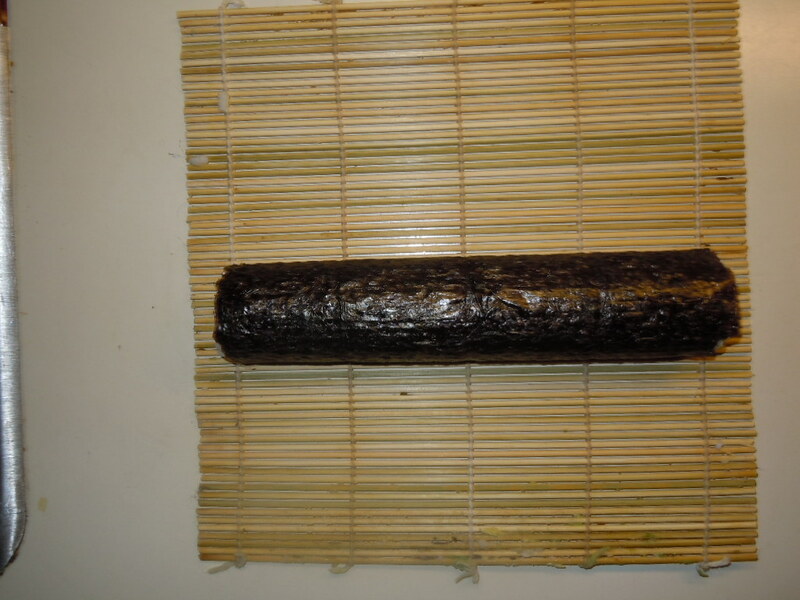 All the ingredients that get rolled inside the seaweed can be found at any Safeway, Giant, Food Lion, etc. They include rice, vegetables and seafood, but could also include chicken, pork and beef. 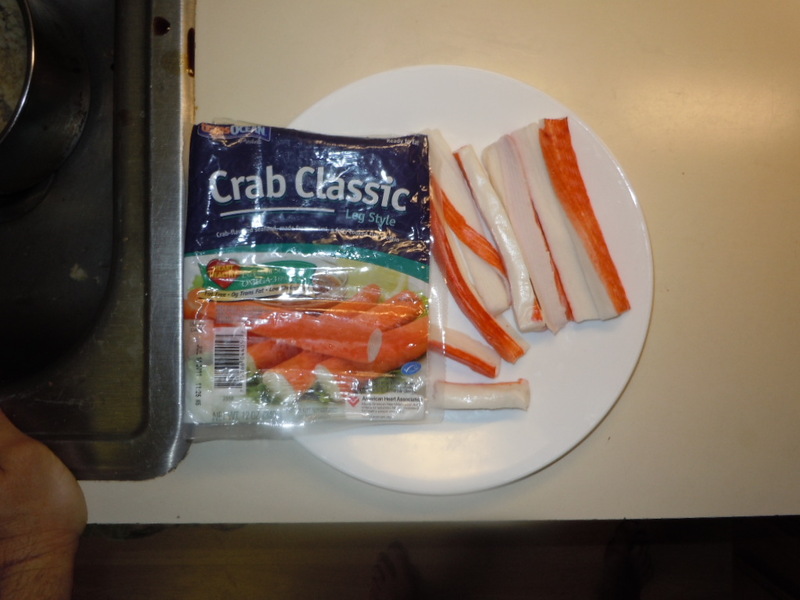 If you want specialty items such as eel or squid, then you'll need to find an Asian market. I have never used raw fish or shellfish in my sushi because of concern about bacteria. Cooked shrimp, crab, and fake crab suit my purposes just fine. If you want to be bold and use raw tuna, salmon, etc, that's your decision. In addition to meat/seafood, you will probably want a crunchy vegetable such as cucumber, carrot, bok choy, etc. I also like to add avocado to give it a smooth texture. Cut the vegetables and meat into strips. How thin? That's a matter of trial and error. Like any other skill, making sushi involves a learning phase. I'd say to start with a width of a quarter to half an inch. Since each ingredient adds girth to the finished roll, you'll probably want to limit the total number of meats and vegetables to 3 or 4. 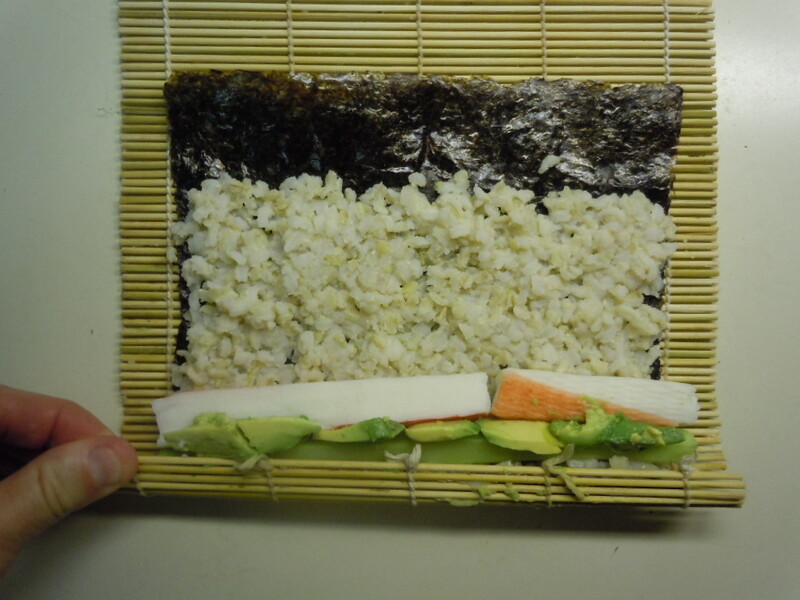 Contrary to popular belief, you don't need the specialty Japanese short-grain "sticky" rice to make sushi. 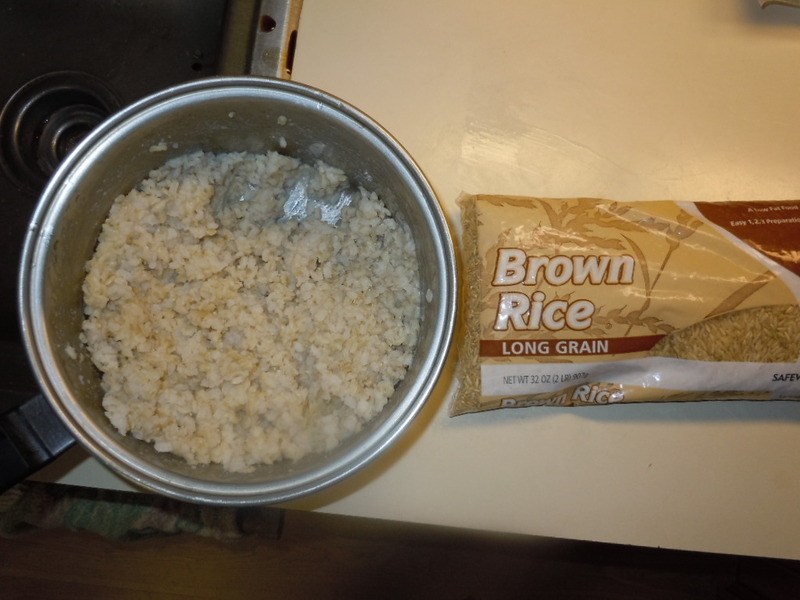 I use regular everyday brown rice and it works just fine. The trick is to drain any excess water so the cooked product isn't too wet. Also, brown rice is more healthful than white rice. Okay, the rice has been cooked and the other ingredients have been cut. Now let's create our sushi rolls. 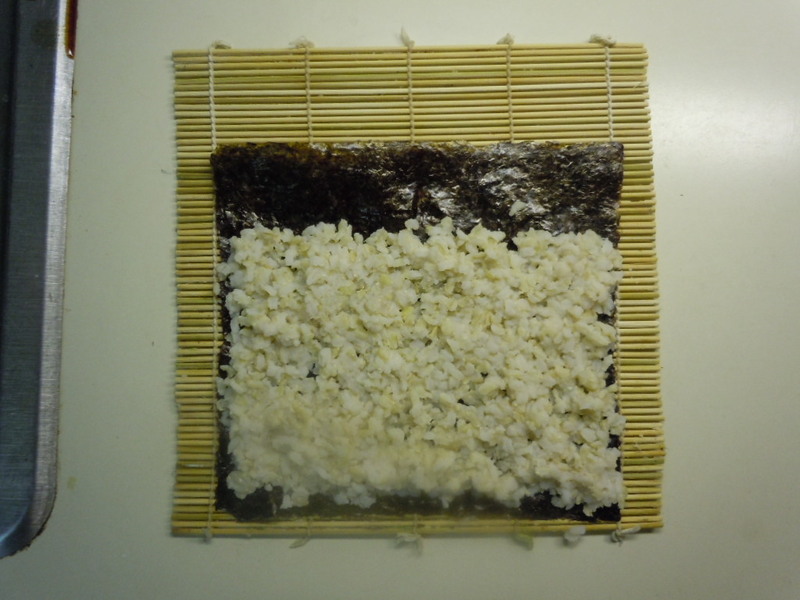 First place a seaweed sheet on the mat, and cover the seaweed with a thin layer of rice, except for about a one-inch strip at the top. 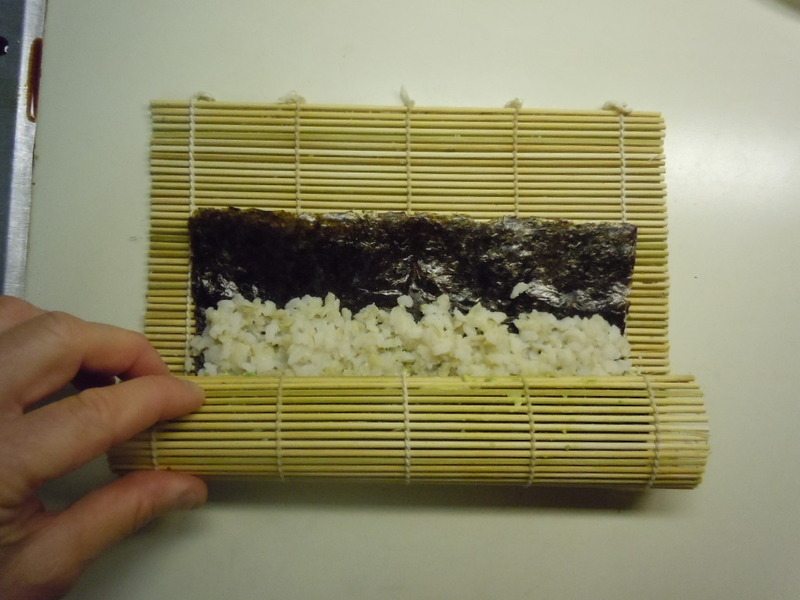 You might have to wet your fingers periodically to keep the rice from sticking to them. Next lay a strip of each ingredient across the rice near the bottom. It is better to lay them across a bit too wide than not wide enough. 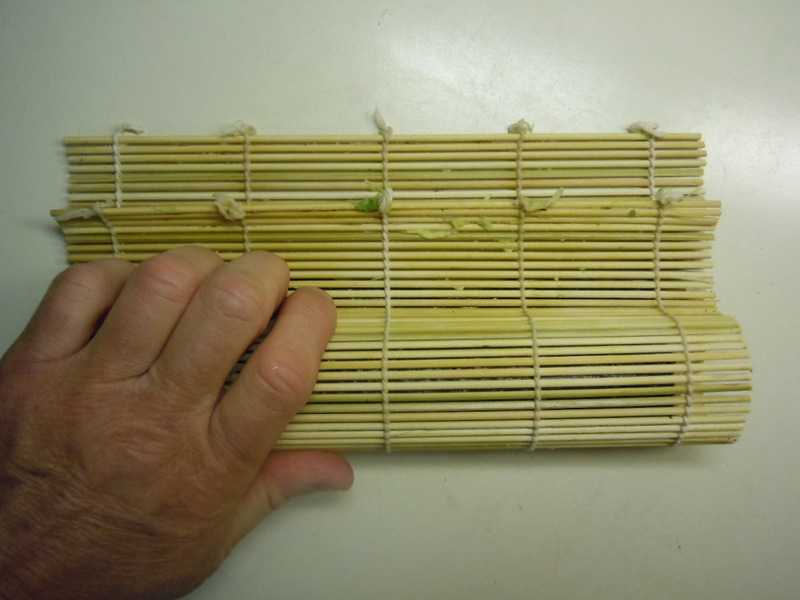 Here's where the tricky part comes: rolling it properly. The important thing to remember is to roll it tightly. 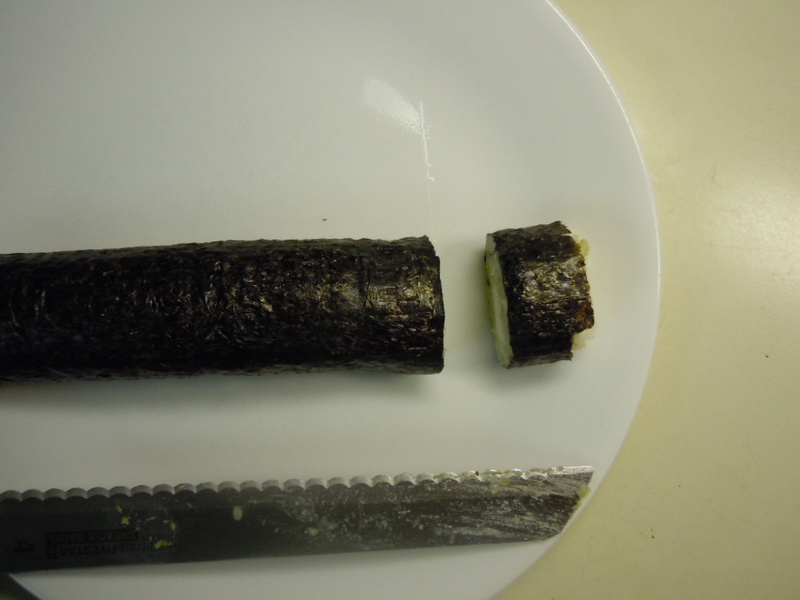 Sushi that is rolled too loosely falls apart when you eat it. Rolling it properly is a learned skill that will simply take practice. First turn up the mat from the bottom. Roll it carefully, using both hands to wrap it tightly (the photo only shows one hand because I needed the other to snap the photo). When the end of the mat is about to get rolled under, pull it out so it doesn't get trapped. Keep rolling tightly while pulling the end of the mat back. 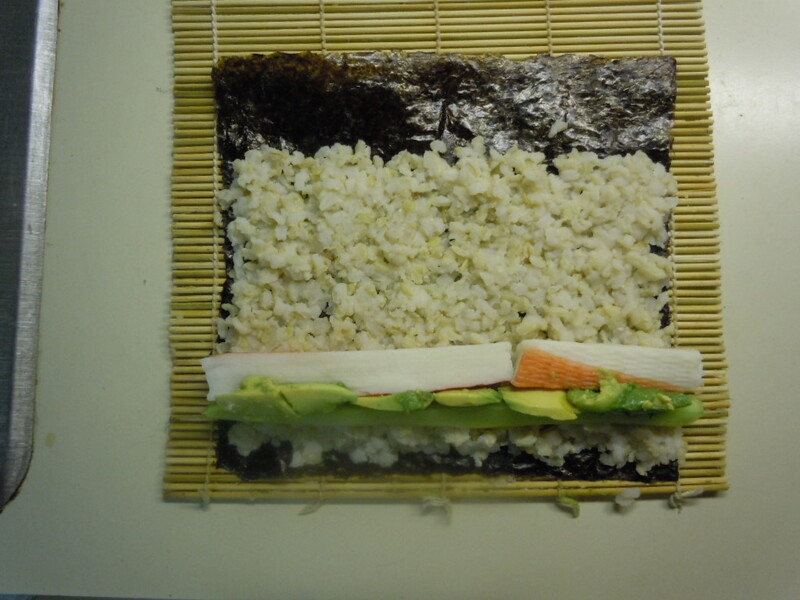 ...a neat sushi roll! 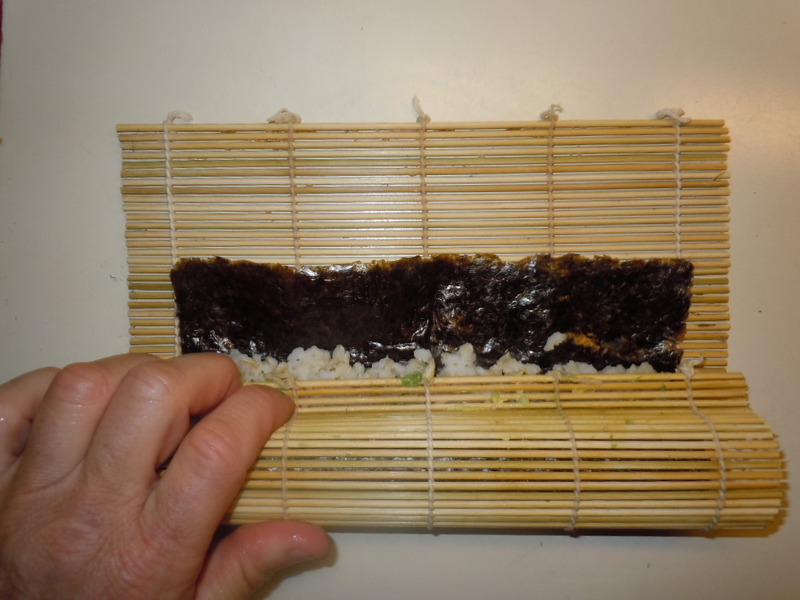 The one-inch bare strip of seaweed should have sealed due to moisture. If not, wet it and seal it. Now simply cut the roll into pieces about an inch wide. Use a sharp, serrated knife. 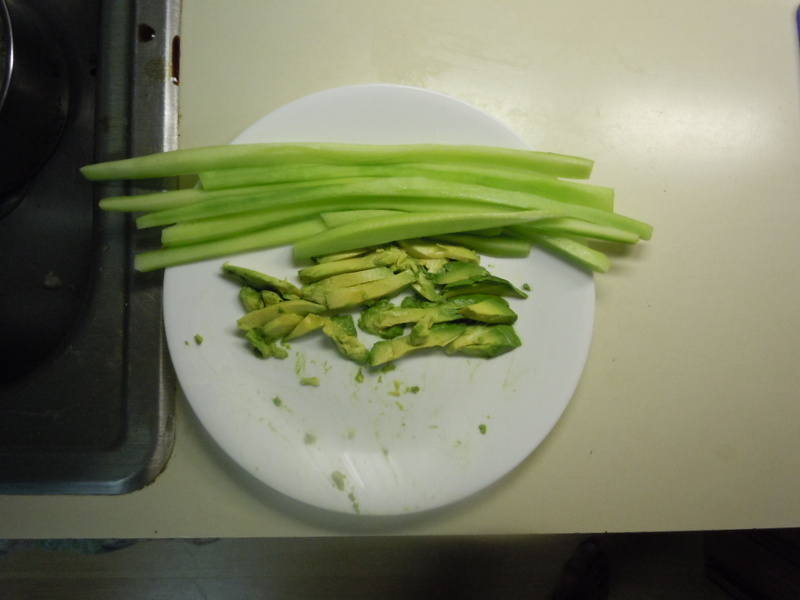 You might have to wet it before each cut to minimize sticking to the rice. Nothing to do now but eat and enjoy! I like to flavor it with soy sauce and pickled ginger. Soy sauce is sold at all grocery stores. 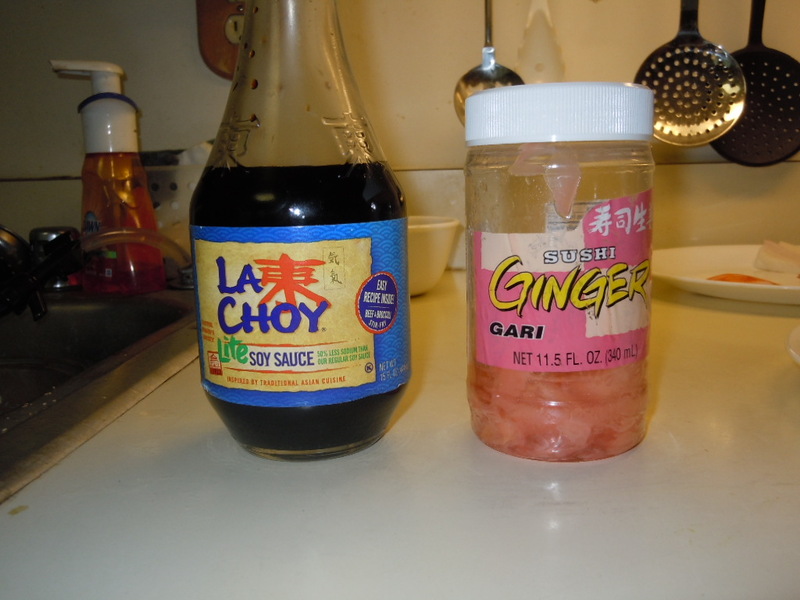 Pickled ginger is sold at most Asian grocery stores, some non-Asian stores, and several online places including Amazon. Some people also like to add wasabi, which is available online and in some grocery stores.